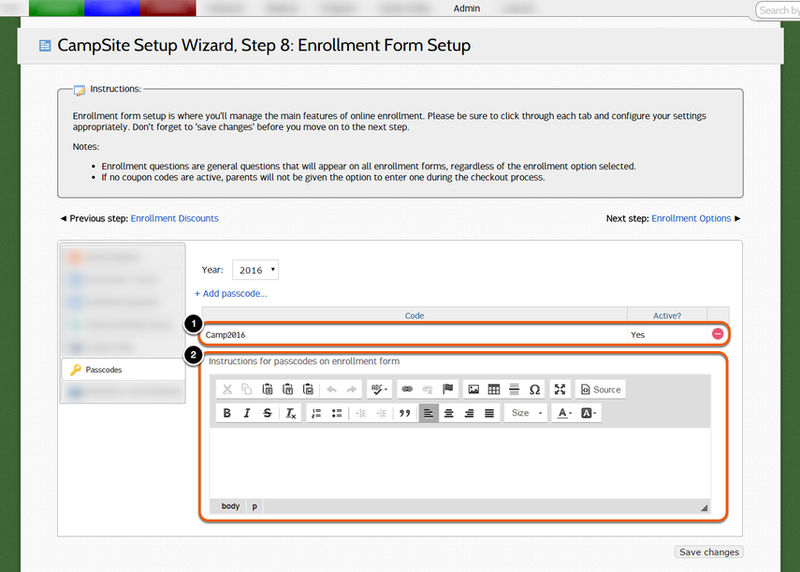 Enrollment form setup is where you'll manage the main features of online enrollment. Enrollment form setup can be accessed through Admin > Camper > Setup Wizard > Step 8: Enrollment Form Setup. 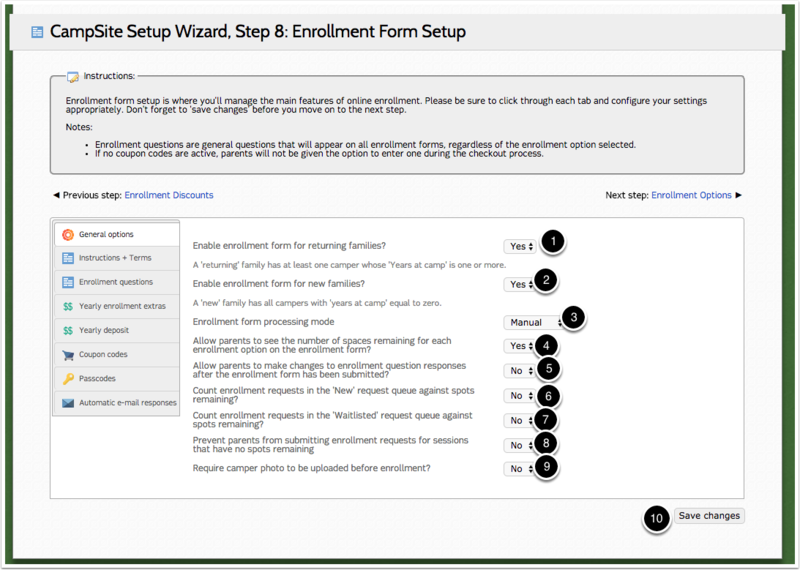 The General Options tab allows you to determine which types of families may access the enrollment form, determine the information they may see on the enrollment form, and set your enrollment form processing mode. 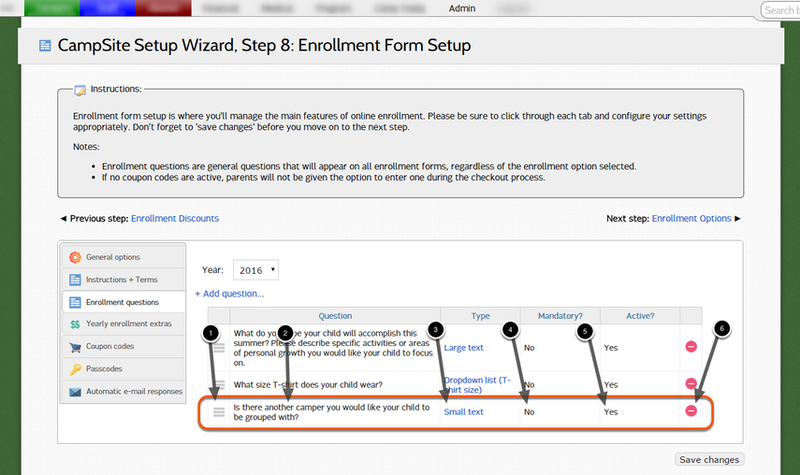 Select whether or not you would like to enable the enrollment form for returning families. Returning families have at least one camper on their profile whose "Years at camp" field is one or more. Select whether or not you would like to enable the enrollment form for new families. New families are families with campers who all have "Years at camp" equal to zero. 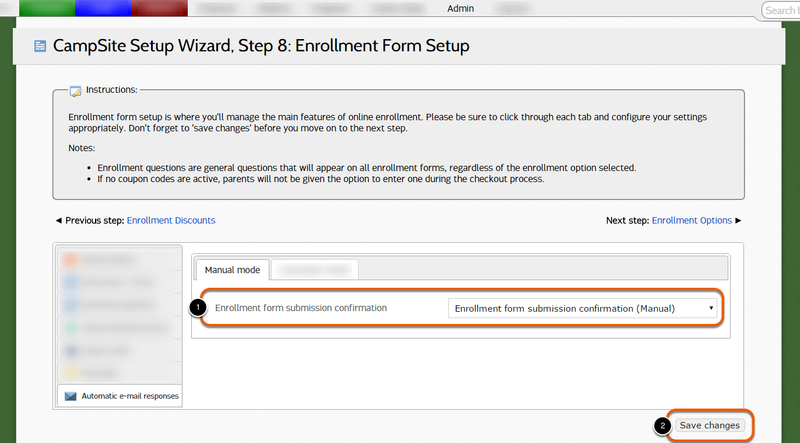 Manual processing mode allows administrators to review camper enrollment information before the request is approved. 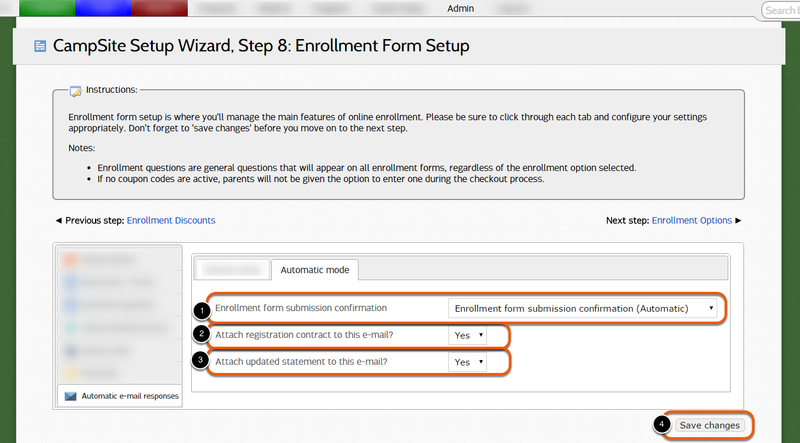 Automatic processing mode will automatically approve enrollment requests submitted through the Parent Dashboard if there is space available based on the enrollment options selected. Automatic processing mode requires families to use an electronic payment method. 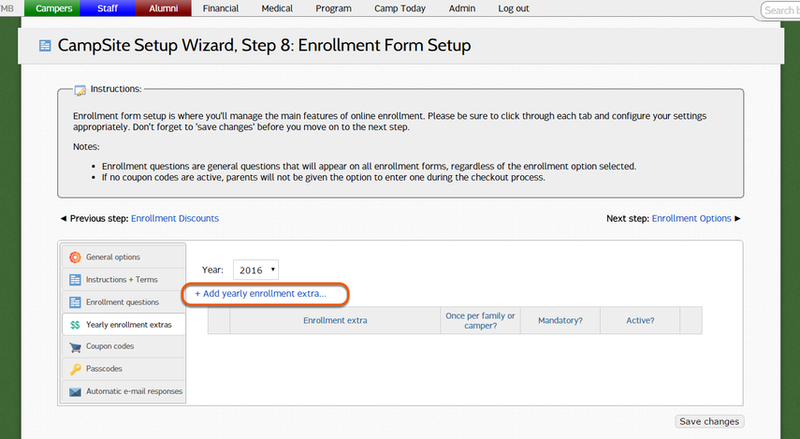 Select whether or not you would like parents to see the number of spaces remaining for each enrollment option based on their camper's basic information. Select whether or not parents can make changes to enrollment question responses after the enrollment form has been submitted. 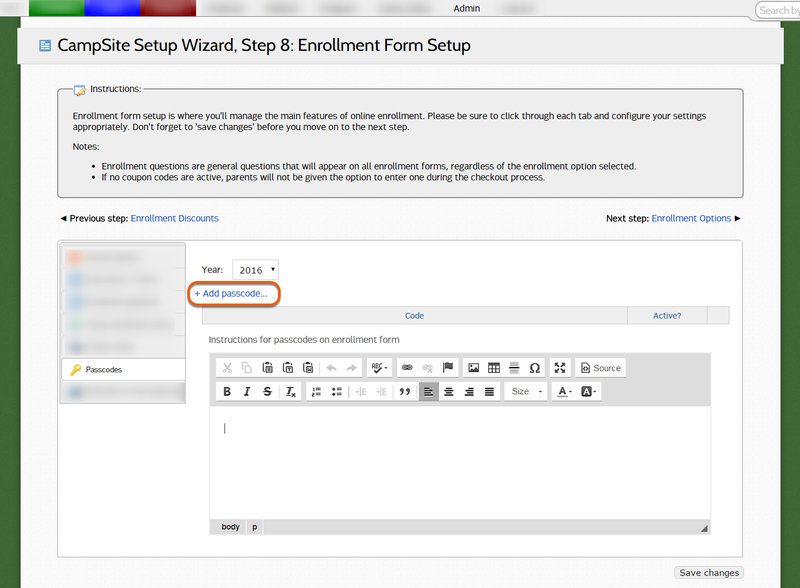 Select whether or not enrollment requests in the "New" queue will be counted against the number of spots remaining in a session. Select whether or not enrollment requests on the Waitlist will be counted against the number of spots remaining in a session. Select whether or not you would like to prevent families form submitting enrollment requests for sessions that have no spots remaining. If set to "Yes", sessions cannot be selected once they have hit their capacity. Require camper photo to be uploaded before enrollment. After making selections, click Save changes. The Instructions and Terms tab allows you to provide additional information on each page of the enrollment form, and enter the terms and conditions parents must agree to when submitting an enrollment form. After adjusting text, click Save changes. Enrollment questions allow you to collect additional information about all campers completing an enrollment form, regardless of the enrollment options they select. You can select the question type when creating each question in order to determine the most appropriate response from families. 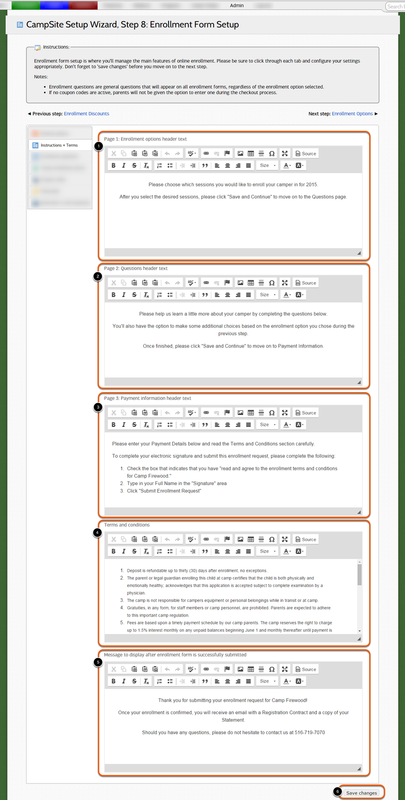 To read more on each question response type, click here. 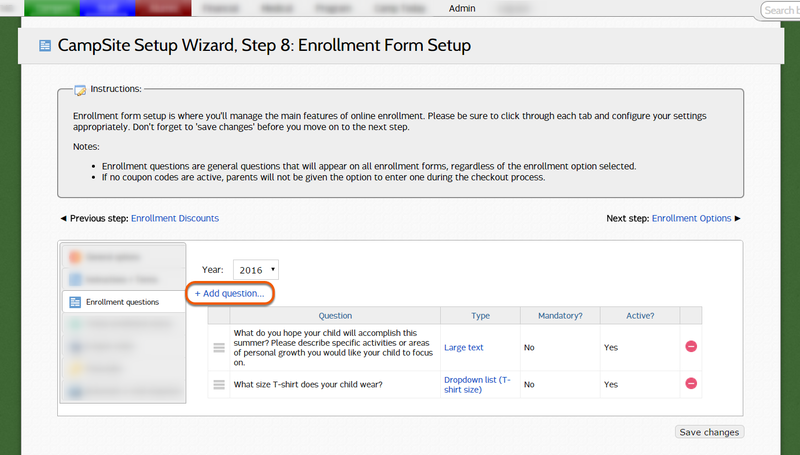 To offer parents to purchase one of your enrollment extras you created on Step 6 on a yearly basis, set it up as a yearly enrollment extra here. 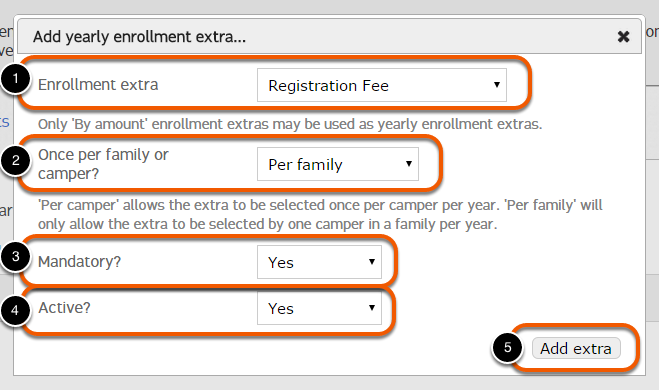 Yearly enrollment extras are offered once per year, regardless of how many enrollment options the camper enrolls for in a given year. Yearly enrollment extras are often used for once-per-year registration fees that may be applied for once per family, or once per camper. 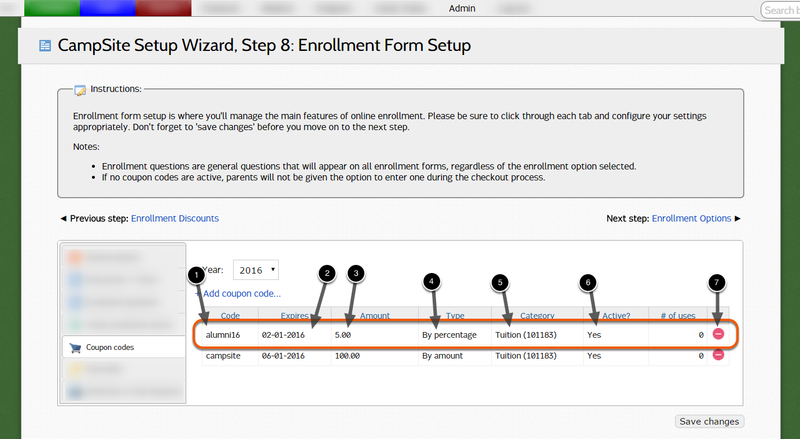 Please note that only "by amount" enrollment extra can be set as a yearly enrollment extra. 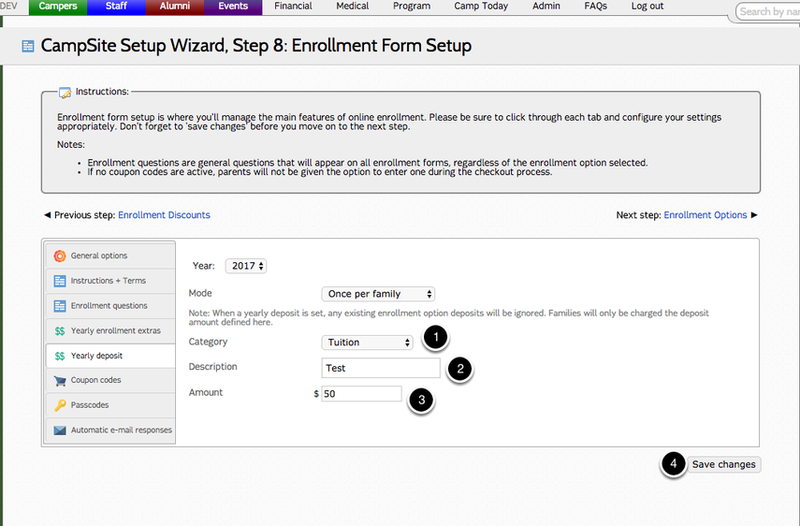 Note that you can also offer enrollment extras on each individual enrollment option you create on Step 9. This section is for camps that wish to capture deposits once per year rather than per enrollment. Give the category a description. Note: When a yearly deposit is set, any existing enrollment option deposits will be ignored. Families will only be charged the deposit amount defined here. Coupon codes allow families to enter a code during the enrollment checkout process to receive a discount on their camper's enrollment. Coupon codes can be created as a fixed amount, or percentage. 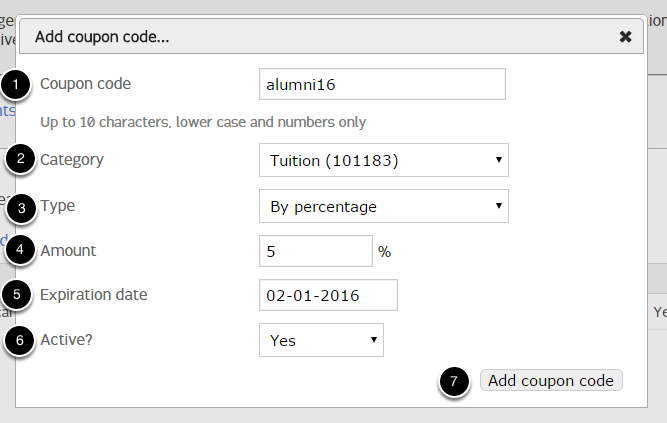 If "by percentage" is selected, the value of the coupon code will be calculated based on the total charges (tuition plus enrollment extras) for the enrollment checkout. The new coupon code will be added. Double-click to delete a coupon code. Once a coupon code has been used, it cannot be deleted. 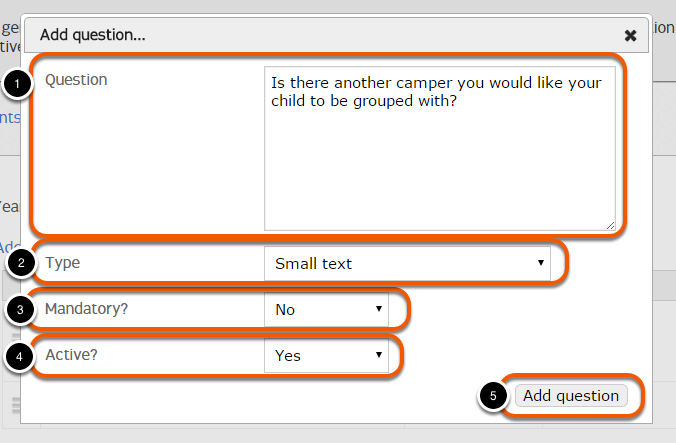 Passcodes allow enrollment options to be hidden on the camper enrollment form until a valid code is entered by the parent. The new passcode will be added into your database. To apply this passcode to a particular enrollment option, edit the "Passcode" tab of the enrollment option on Step 9 of the Setup Wizard. 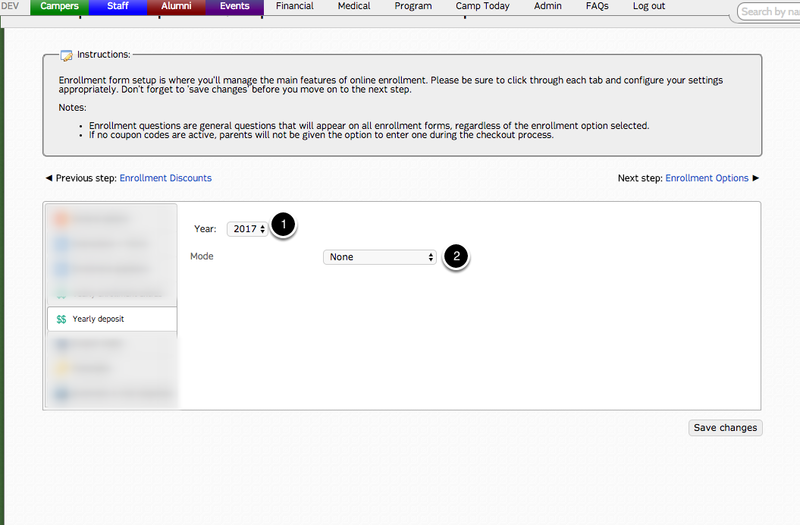 You may also provide specific instructions to be presented within the passcode section of your enrollment form. The Automatic E-mail Responses section allows you to choose which saved e-mail families will receive when submitting the enrollment form. If your camp is using Manual Processing mode for enrollment requests you should select the Automatic e-mail response for Manual mode. If your camp is using Automatic Processing mode for enrollment requests you should select the Automatic e-mail response for Automatic mode. Select whether or not you would like the registration contract attached to the confirmation e-mail. The registration contract contains enrollment details and your camp's terms and conditions,. Select whether or not you would like an updated financial statement attached to the confirmation e-mail.